I have so many projects to finish, but I wanted to start off 2015 with a project that I have been yearning to try....free motion quilting. Now I have tried this before, but was really encouraged when I picked up Christina Cameli's book - First Steps to Free-Motion Quilting. 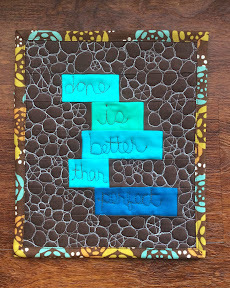 I chose to complete a small sign - about 8x9.5" - to hang near my sewing machine. I free motion quilted this on my Baby Lock Jane. I feel so proud that I was able to complete the project in just a few hours and that I didn't give up! I really enjoyed the process and I stayed relaxed! If you are interested in free motion quilting, you have to pick up this book! You can purchase the hard copy or the kindle version...I have both!